John Wooden is considered one of the finest coaches ever. He won a total of 10 national titles at UCLA, including seven in a row. Coach Wooden was unique in how he taught his players to focus inward. He didn’t scout upcoming opponents and discouraged players from watching professional basketball games—fearing they might pick up poor habits. Coach Wooden saw how competitive contests typically involve two sets of opponents. The first is those we compete against. The second is ourselves. 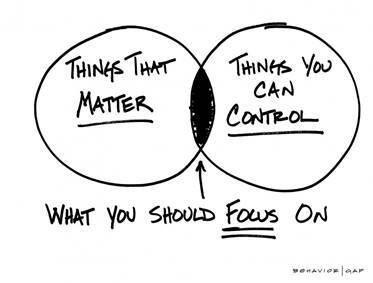 We can’t control the former, but we can control the latter. On the basketball court, Wooden had strict practices on consistent schedules. The drills the players ran at UCLA were not innovative; they were essentially the same as grade school—layups, free throws, ball handling and passing. Some of the coach’s rituals were even more basic. I mean really basic. For example, each season he taught players how to pull up socks and lace shoes properly. “He didn’t want blisters,” said one player. Coach Wooden did not define success by wins or losses, but instead by the daily development of oneself. He focused heavily on planning and preparation. 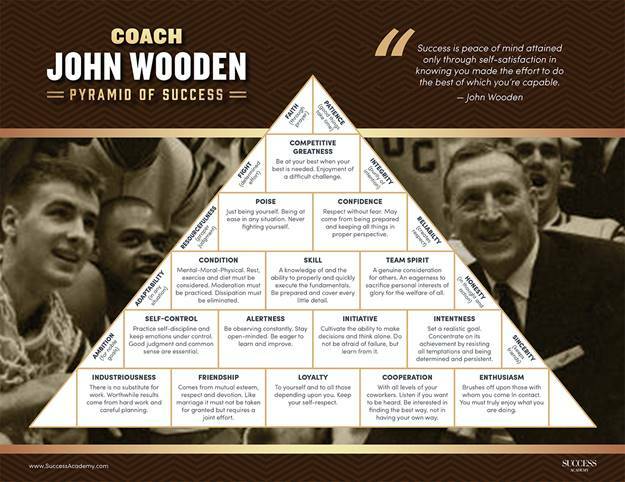 Around 1948, he created an iconic triangular diagram called the “Pyramid of Success.” The pyramid embodied a range of character traits Wooden believed formed a solid foundation for personal success. He saw basic qualities like poise, confidence, and initiative as the cornerstones for achievement in both sports and life. The ‘Wizard of Westwood’ was like the Wizard of Oz. Behind the curtain, he appeared to be a normal man rather than a magician, yet his teams performed magical feats, winning an unprecedented number of championships. Even though flashy plays draw “oohs and aahs,” wins and losses still come down to one simple thing: shooting a ball through a net. Many basketball championships are decided on which team performs best in the final key moments of a game, i.e. ‘Crunch Time.’ Coach Wooden’s teams were guided in clutch moments by strong fundamental and mental anchoring. One building block of Wooden’s pyramid is “Competitive Greatness”—defined as the ability to be at your best when your best is needed. Crunch time for investors arises when volatility spikes, like the week before last. When a storm visits a harbor and starts rocking boats, the boats don’t float away if properly anchored. Most investment portfolios should behave similarly when volatility waves start to roll in. Do you have an anchor to your investing program? A core reason to stay grounded in whatever it is you’re doing? Such discipline arises from a strong belief that what you’re doing is logical or a sound fundamental basis to your strategy. There are three fundamentals of investing being rewarded in the market now, that are also likely to maintain efficacy long-term. Experienced investors recognize that markets have seasons, and that before long, winter is coming. The investment cycle is mature, and that’s when sound defense is rewarded. One fundamental principle to help survive a harsh winter is to avoid highly indebted firms. Are you worried about higher interest rates? The next recession? If the next leg of the cycle is higher inflation, debt will become more expensive, putting highly indebted firms at a relative disadvantage versus firms with cash rich balance sheets. Also, when the economy eventually turns down, credit spreads will widen from their currently low levels, penalizing highly indebted firms with credit risk. Lately, the market likes cash rich companies. Over the last year, the top 20% of U.S. stocks with the highest cash as a percentage of assets have outperformed the bottom 20% (most highly indebted firms) by 28.4%. The spread was +5.4% last January alone (source: Bloomberg). Investment idea to play theme: AQR’s Large-Cap Defensive Style Fund (ticker: AUEIX). The fund’s holdings have a debt/equity ratio of 0.88, which is lower than the Russell 1000 Index at 1.03. Consider this fund a warm coat to help protect you from the cold, once winter arrives. The business world tends to exhibit “winner take all” patterns, and in a growth-oriented cycle especially, it pays best to ride winners. In the last year, U.S. firms in the highest quintile for year-over-year sales growth outperformed the bottom quintile by 19.3%. Last month, the spread was +1.5%. Late-cycle, after a lot of money has already been rotated to stocks from other asset classes, can be a dangerous time to fish for value plays. Individual stocks have been picked over by a lot of eyeballs, and cheap stocks tend to be cheap for a reason. Hence, it’s an appropriate time to avoid being overly cute. Favor quality firms with above-average economics. Steady growth is a sound fundamental that will always be rewarded; much like shooting skills in basketball. Investment idea to play theme: iShares Edge MSCI Quality Factor ETF (ticker: QUAL). This multi-factor ETF favors profitable companies which generate above-average returns on equity. Coach Wooden wanted players to continually focus on developing their skills. The market likes companies which do the same thing—i.e. firms with high research and development budgets. These firms aren’t resting on their laurels or just trying to best peers in the next earnings season. Rather, they are focused on being the best they can be over the long-term. That sort of mentality is key to maintaining long-term success. Over the last year, firms with the highest R&D/Sales have outperformed the bottom quintile by 16.7%. Over the last month the spread was +1.3%. Investment idea to play theme: The Knowledge Leaders Developed World ETF (ticker: KLDW) is a thematic strategy geared to innovative companies around the world that invest heavily toward intangible assets; i.e. R&D and brand development. Evidence suggests many market players are not emphasizing fundamentals right now. For instance, a recent survey of fund managers by Bank of America Merrill Lynch showed over 40% (the highest percentage ever) saying they think equities are overvalued. Oddly enough, the very same responders also reported being overweight equities. The survey reflects a “Greater Fools Theory” of investing (i.e. the security I own may be overvalued, but someone is likely to buy it from me at a higher price, so I am content to hold it anyway). These managers are playing an outwardly focused game, pivoting bullish or bearish based on price rhythms dictated by others. If volatility persists in the coming weeks, keep in mind Coach Wooden’s philosophy. Focus inward and make sure you’re practicing sound fundamentals across your holdings.